Eni CEO Claudio Descalzi (center) signed heads of agreement with Oman’s oil and gas ministry and BP for possible exploration of Block 77, located 30 km east of the BP-operated Khazzan Field. Source: BP. Eni has gained a suite of new exploration opportunities in the Middle East by signing agreements in the United Arab Emirates, Oman, and Bahrain, part of the firm’s campaign over the past year to strengthen its foothold in the world’s most prolific oil and gas region. Following Abu Dhabi’s first open-block licensing round last April, Eni announced 12 January two concession agreements with Abu Dhabi National Oil Company (ADNOC) in which the Italian firm will serve as operator with a 70% interest of the 8000-sq-km offshore Blocks 1 and 2, northwest of the emirate. The remaining 30% stake will be held by Thailand’s PTT Exploration and Production (PTTEP). The agreements call for Eni and PTTEP to spend $230 million for exploration as well as appraisal of two existing discoveries on the blocks. The firms will take part in ADNOC’s “mega” continuous 3D onshore and offshore seismic survey, capable of capturing high-resolution images of complex structures reaching 7600 m below the surface, according to news releases from Eni and ADNOC. Should a commercial discovery be made, ADNOC will have the option to take a 60% stake once the discovery is brought on production. Eni in 2018 entered Abu Dhabi with the award of a 10% interest in the Umm Shaif and Nasr Offshore concession and 5% interest in the Lower Zakum concession. The firm in November said that it received a 25% stake in Abu Dhabi’s Ghasha concession, a major offshore gas project consisting of several fields. Three of those fields— Hail, Ghasha, and Dalma—make up an ultrasour gas project that is expected to produce more than 1.5 Bcf/D after it comes on stream in the mid-2020s, Eni said. In the neighboring Sharjah, Eni said 13 January that it was awarded onshore exploration concessions covering Areas A, B, and C as part of the emirate’s first international competitive exploration licensing round. Eni will serve as operator with a 75% interest of Areas A and C, which cover 437 sq km and 1184 sq km, respectively. Sharjah National Oil Corporation (SNOC) will hold the remaining 25%. Eni and SNOC will split interests 50-50 in the 264-sq-km Area B, with SNOC acting as operator. Fresh off entering offshore Oman in 2017, Eni has established an onshore presence in the country through an exploration- and production-sharing agreement for the 8524-sq-km Block 47 in the Omani A’Dakhiliyah Governorate, the company said 14 January. Awarded as part of the 2017 Oman Licensing Round, Eni will be operator of the block with a 90% interest. Oman Oil Company Exploration and Production will hold the remaining 10%. Exploration activity is expected to begin this year. 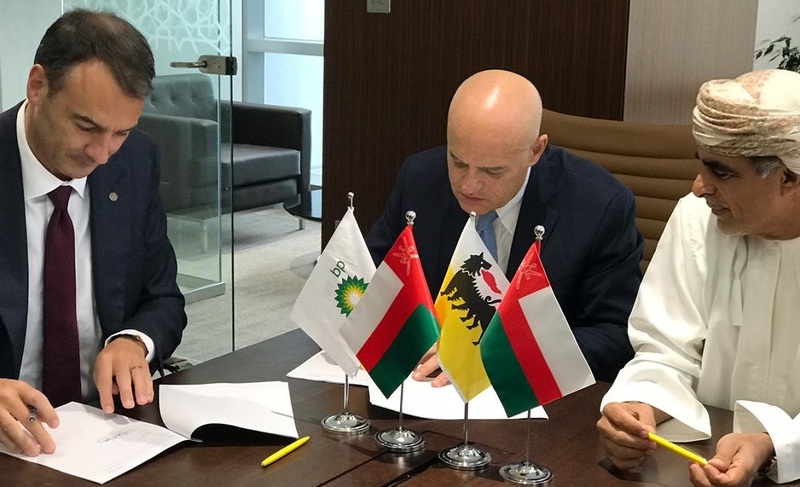 Eni is also partnering with BP to work with the Omani government to set up an exploration- and production-sharing agreement for the 3100-sq-km Block 77, which lies 30 km east of the BP-operated Khazzan Field. Eni would become operator during the exploration phase and split interests 50-50 with BP. A fourth agreement reported by Eni, with the National Oil and Gas Authority of the Kingdom of Bahrain, is intended to pave the way for exploration of Bahrain’s 2800-sq-km offshore Block 1. Descalzi said the pact “will allow Eni to start cooperating and investing in a country that was one of the first in the Gulf to produce oil and which now aims at unveiling its offshore potential. Eni’s activity in the Middle East also extends into Iraq and Lebanon.